This hasn’t exactly been Glamour‘s most successful year in terms of producing innovative and compelling covers, having amassed a slew of hits and misses throughout 2017 (more misses than actual hits). As a result, Glamour goes all out with its offering for December, proudly unveiling a selection of covers for the annual ‘Women of the Year’ edition. The list of women closing out 2017 includes Gigi Hadid, Nicole Kidman, Solange, Samantha Bee and organizers of the Women’s March, Muzoon Almellehan, Patty Jenkins and Peggy Whitson. One cover, in particular, appealed to our forum members most. “We are now living in a topsy-turvy world where a Gigi Hadid cover looks better in many ways than a Solange and Nicole Kidman one. My fan club cards for the latter two should be revoked for saying this,” wrote Benn98 upon checking out the covers. “My favorite here is Gigi, I like the attitude and the colors. The other covers have a nice color scheme but the images are nah,” added Srdjan. “Thank God for that! I actually like the shot just because it’s not typical of a major American magazine,” added magsaddict, admiring Gigi’s cover. “I don’t like Solange’s (I didn’t even recognize her) and Nicole’s is boring. I do like Gigi’s! I wish we would get more smiling cover. Her smile looks a bit fake but somehow it still works,” KateTheGreatest commented. 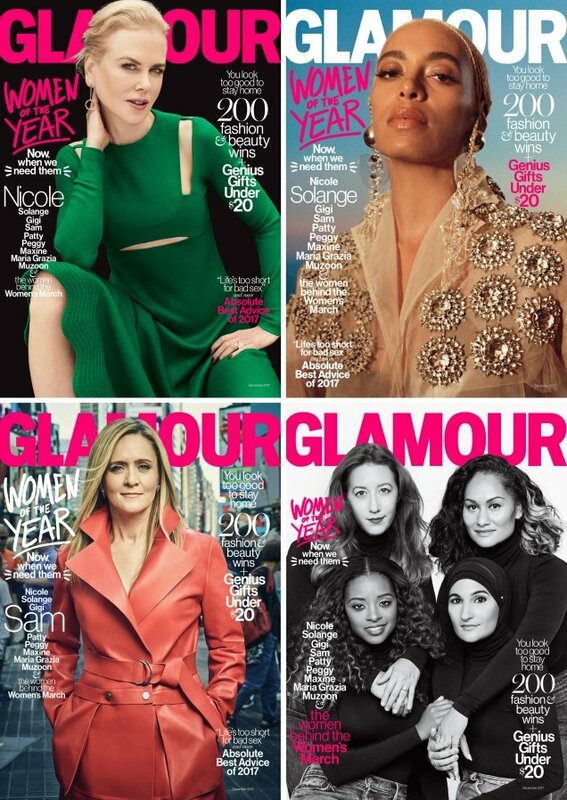 Check out more from Glamour‘s latest and let us know which cover you’ll be hunting down here.